I've already fully reviewed these and they've been in most of my empties. In essence they are very moisturising and smell divine. This specific one smells like artificial oranges (not my favourite scent of the bunch). I'm trying to find the perfect lip balm and let me tell you it is not easy. So I'll finish the ones I have but I'm not 100% sure about repurchasing it. I probably should have put these together but whatever. The scent of this one is a bit strange but pleasant it's hard to describe but I will say it doesn't smell like cherries. It's not an overwhelming smell but the scent is a little sweet. I love the colour combo on the packaging of this one. It's so pretty. This does NOTHING for my lashes. I'm glad this was a sample and I got this for free (from my aunty). To be honest I don't know if this is actually available but I wouldn't bother looking for it. It's really bad. I got both of these free, one with the Priceline beauty bag and the other in the Priceline beauty club bag. I've heard a lot of good things about this liner and I was expecting quite a lot from them. But when I tried it, it was really rough and tugged on my waterline. I'm not too sure what's wrong with them but if you have any tips or if you've had the same experience PLEASE let me know. 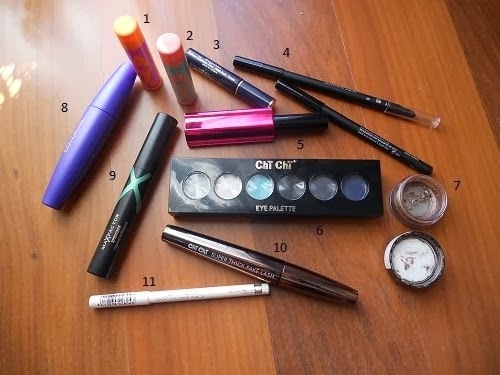 This works extremely well at keeping eyeshadow on all day. It's so affordable (RRP $12.95), it works well and the product itself lasts a long time. It has a doe foot applicator so what I like to do is put the product onto my finger then spread it over my eyelids. It goes on clear so anything you put on top will be true to colour. I got this and a mascara, that I will mention later, for $15. I thought it was such a bargain because mascaras alone are pretty expensive in Australia. Because it was such an amazing deal I got it. But seriously this palette has terrible pigmentation and the shadows are also quite chalky. There are 2 shadows out of the palette that are decent, but I hardly use it so I decided it was time for this one to go. I'll probably give it to my younger cousin that likes playing with makeup. I've done a comparison review of this and Bad to the Bronze if you want to check it out here. In a nutshell I used this up just to get rid of it. I know that seems harsh but it was patchy on my eyes which ruined what would otherwise be an amazing eyeshadow. The colour was beautiful and lasting power was okay (even better with the Australis primer), it just applied horribly. But I have Bad to the Bronze which is basically the same colour. I cannot tell you much about this mascara except that it made lashes fall out more than normal. The eye makeup remover I use is normally really good but when I went to remove this 4-5 lashes would fall out. So I stopped using this after 4 or 5 times. It just wasn't worth it to me. I'd rather have naturally nice lashes than feel the need to wear mascara all the time because all my lashes have fallen out. From what I remember (vaguely) is that it made my lashes really black and voluminous which I enjoy. At first I was hesitant about the colour because it was dark brown but I didn't mind it because it was fairly dark for being a brown mascara. It didn't do much for lengthening my lashes but it did a fairly good job at volumising and defining them. Overall I quite liked this mascara it made my lashes look better than my normal lashes but still natural. However I've discovered (over time) that I like my lashes looking more dramatic. This is the first mascara I ever used when I started getting into makeup which was about 1-2 years ago. This is the mascara I bought with the chi chi palette I mentioned above but I've definitely seen this sold separately in stores in case you're interested. I don't recall much about this mascara but I remember liking it then disliking it (but it's probably because it dried out and I didn't know what that meant at the time). I will say though there is a dip in the wand so make sure you don't use that section otherwise you're lashes will clump like nobody's business. I haven't used this in years so I decided to chuck it out. And because it's so old I think that's why when I tried to use it recently it was really rough and hard on my eyes. Plus it's too stark white for me to use with my skin tone. What products have you finished up?